There’s no shortage of accessories you can buy for any console. But few Switch accessories will give you more value than a second dock. Especially if you travel anywhere with your Switch. For such a simple device, the dock is the cornerstone of what makes the Switch such a compelling console. Drop your device in the dock and you’re playing on the TV. Pick it up and you’re mobile. Convenient! Except that convenience flies out the window if you have to keep disconnecting your dock every time you travel, or just want to play in another room. The official Switch dock normally costs around $90 (though it’s often on sale for less), but the convenience is well worth it. In our house, we have two docks. One stays plugged into the TV in the living room. When a Switch isn’t in use, it sits in the dock charging. The second dock is the mobile dock. Sometimes it might move to another TV in the house, other times we throw it in a bag for when we travel. At a friend’s house? Plug it into their TV and it’s time for a Jackbox party. Bored in a hotel room? Hook it up and it’s time for some Smash. If you coil the cable properly, you can even keep the AC adapter inside the dock. Of course, you could use the dock that came with your Switch. In my experience, however, having a dedicated travel dock makes it easier to improvise an outing. The travel dock stays in a car or a bag, so I don’t have to plan ahead before I bring it to a friend’s house. It’s just there, ready and waiting. Contrary to the lofty promises in Nintendo’s first Switch ad, it’s not actually much fun to gather around the tiny Switch screen. Fortunately, the official Switch dock comes with everything you need to hook it up to a TV. 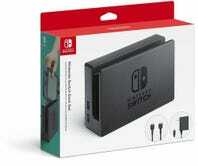 Aside from the dock itself, it comes with a power adapter—which you can also use to charge your Switch directly—as well as an HDMI cable. The AC adapter cable is even small enough that, as long as you’re halfway decent at coiling cables, you can fit it inside the back of the dock when it’s not in use. Just be careful not to bend and damage the cable. 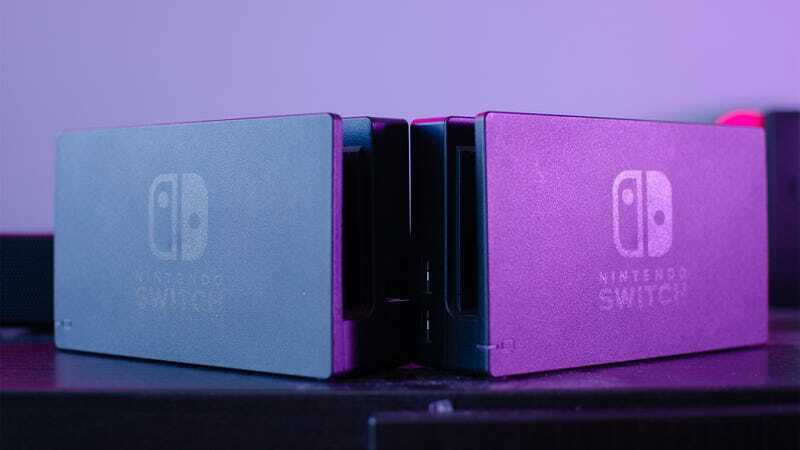 There are other, cheaper Switch docks on the market. However, users of those docks have reported bricked consoles when using them on the wrong firmware. Nintendo officially recommends against using unlicensed docks (as they would), and for now, so do we. Still, even at the price Nintendo charges for the official dock, it’s a worthwhile convenience to always have a party in your travel bag.